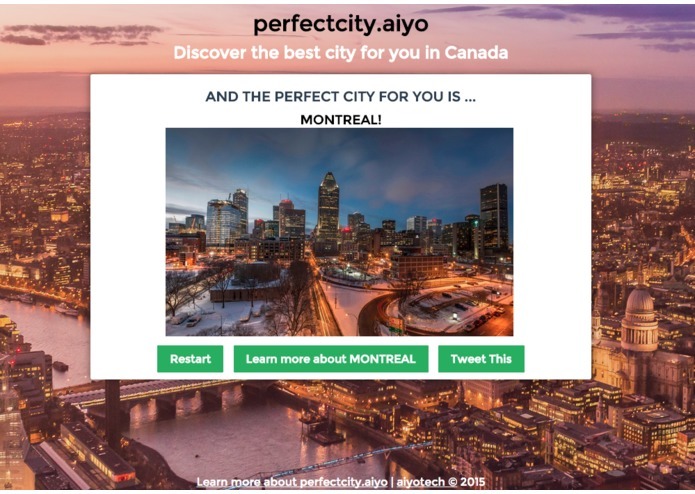 A way for you to discover your perfect city! Just because you were born there doesn't mean that it is the perfect city for you! We have unique lifestyles. A city must complement that lifestyle to ensure that you feel happy and energetic every day. Too often we find ourselves in cities that do not suit us. Perfect City was created to solve that problem! 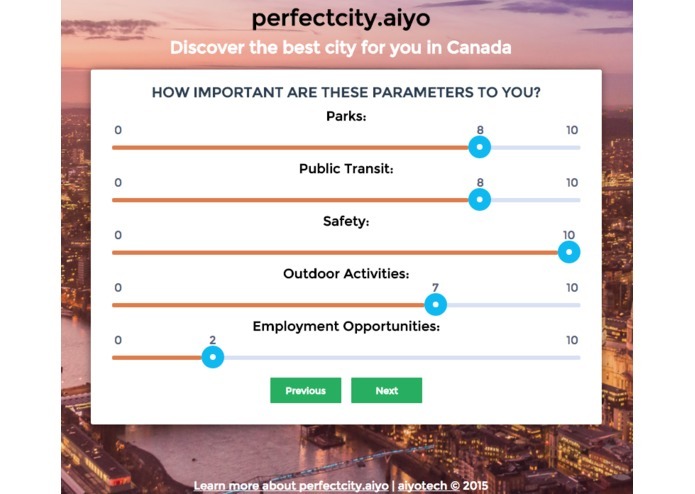 Perfect City uses a modified version of the collaborative-based recommendation algorithm to determine similarities between you and the cities in our database. It's not as simple and you can find all the information on our about page. Lack of standardized datasets for various features on cities. This meant that we needed to do our own curation to incorporate multiple datasets into one to be able to make suggestions. We decided to go with Canadian cities due to the smaller number and better availability of data. The curation process is documented in this iPython notebook. As expected, lots of CSS issues. Curating our own datasets, being able to to quickly fix errors in our AnuglarJS and CSS code. Completing this hack over a weekend with quite a high degree of polish! In the future we would like to incorporate weather, cultural and business data and ofcourse more information from other cities around the world! There are also opportunities to use a Twitter sentiment analysis to analyze what people are feeling about their city in real time and incorporate that into the algorithm. The curated (short) data set is available at our github right now. We hope that people will contribute to it to grow it and this can then be used for future analysis (how features relate to each other). Worked on the Front End, used AngularJS, jQuery and wrote a lot of HTML and CSS. 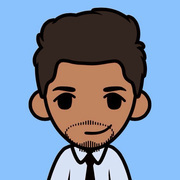 Integrated and cleaned multiple datasets using pandas on python. Exported that to JSON and wrote the recommendation algorithm which will be used in the front end!